In the aftermath of the Rana Plaza tragedy, focus is increasingly on the fashion industry, and the way it treats the workers who put the clothes together. It seems stunningly obvious to me that for clothes to be cheap, there have been corners cut somewhere. If it isn't in the quality of the manufacture, then you can be sure it's in an unequal cut of the profits. But do you know just how unequal that cut is? An infographic from Canadian magazine Maclean's takes a dataset from consulting group O'Roarke, and shows the disparity between the cost of a cheap shirt and the amount that workers and manufacturers get of the money. 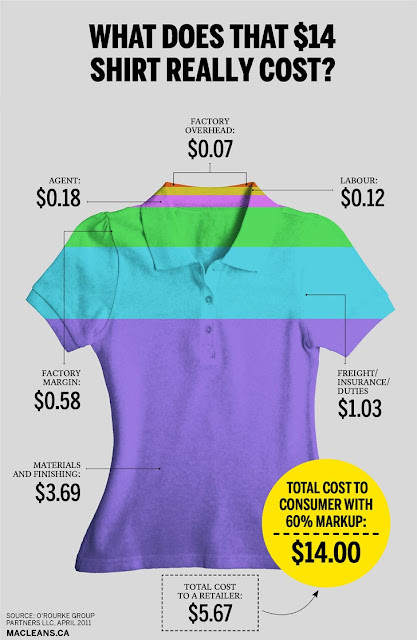 A $14 shirt will cost a retailer $5.67. The worker that made that shirt will receive the equivalent of twelve cents. It's not surprising that calls for a fair deal for all Third World workers are reaching a crescendo. It's clear that something has to change, and if that something is a bit more on a Primark skirt, then frankly it's a price worth paying. Back in April, we highlighted (and joined) Ms. Wanda's 1% Campaign. They're trying to get high street retailers to sign a pledge--commit 1% of their profits to improving their supply chain, making them more ethical and transparent. They've recently published an update. There's good news and bad news. The response from the public has been very encouraging, and bolstered by a groundswell of support, Ms. Wanda's went to three retailers to see what they could do. That's where things go downhill. Of the three, only one, Mothercare, bothered to properly respond, and then to say that they couldn't sign up as they were already involved in other schemes. They refused to say what these schemes were--slightly suspect, as surely any ethical affiliation is good PR. M&S promised and failed to get back to Ms. Wanda's, and Top Shop never replied. This is disappointing, but somehow not particularly surprising. The big High Street names will do things on their own terms, and tend not to respond to public pressure unless it's overwhelming and starting to threaten sales. If we want to shop ethically, and companies want us to shop with them, then they need to be more transparent and take clear and meaningful action. The 1% is a simple way for consumers to know the retailers are taking this issue seriously. And if they are doing it already, then why not just sign up? Why not, indeed? I urge you to join Pier32 and the hundreds of concerned shoppers in getting the High Street to be fair and transparent about where their clothes are coming from and how the workers that make them are treated. Sign The 1% Campaign Petition. It should come as no surprise to regular readers of The View that my admiration of Pier Crush Vivienne Westwood knows no bounds. She's a style icon, effortlessly reinventing herself, always willing to try out new ideas and explore new avenues. All the while, of course, keeping her strong ethical principles firmly to the fore. Her new venture is one that most fashion designers would give their eye teeth for--reworking an airline's uniform. Vivienne's landed a prime gig. She's redesigning the iconic red uniforms of Virgin Atlantic. It's a tricky job. The uniforms are worn by over 7,000 staff members worldwide, in different jobs and levels of movement, at wildly different climates and conditions. In addition, they have to look sleek and stylish. Virgin Atlantic have a seriously classy reputation to keep up, and their uniforms are envied throughout the airline industry. How do you get that balance right and keep it ethically correct? Well, as for the first question, the new ensembles are currently on trial with 180 Virgin Atlantic employees across the spectrum, who are assessing them for fit, comfort and performance before their full launch in 2014. In terms of sustainability, I think Vivienne's already nailed it. She's using recycled materials, and have designed the uniforms to be closed-loop. Once worn out, they can be broken down to provide raw materials for new clothing. In addition, she's designed crew bags made from recycled roadside banners and canvas, with retasked brass fittings. Personally, I really like the jet-age, retro-scifi look that Vivienne's landed with, but then I've always been biased. This is top-flight stuff. For more pics, check out the slideshow over at Ecouterre. Nike are a big name in sports and casual fashion wear. The numbers speak for themselves: the company employs 38,000 people worldwide, and turns over $24 billion every year. With that comes a certain perception that all big names share; that when it comes to sustainability, there has to be something lacking. This is a major problem for Nike. Villainous behemoth is not a good look. A recent article in The Guardian shows how Nike are trying to make it clear to the public and their peers how important sustainability is to them. For example, the new England football kit is made out of recycled plastic bottles. Technology, of course, plays a strong part in addressing sustainability, and the launch of their new Making app shows that off very strongly indeed. The app hooks into Nike's Materials Sustainability Index, and allows users to see which of the 22 materials most used by their designers has the highest scores for environmental impact, recyclability and so on. By sharing their data, Nike hopes to help inspire the new generation of designers to use materials more thoughtfully, and with a more eco-friendly context. "The main concern is performance and aesthetic. We can't compromise on that, it always comes first." Which goes to show that even for a huge company like Nike, sustainability is a challenging issue. Cartoon Movement is a fascinating website that brings together and highlights the best political cartoons and cartoonists from around the world. As a comic-friendly geek, this appeals on all sorts of different levels. 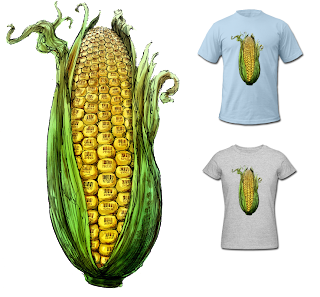 They also have a small webshop selling t-shirts of a few choice designs. I was drawn to this one, by German cartoonist Rainer Ehrt. The best cartoons get their point across in the simplest manner possible, without language barriers getting in the way. 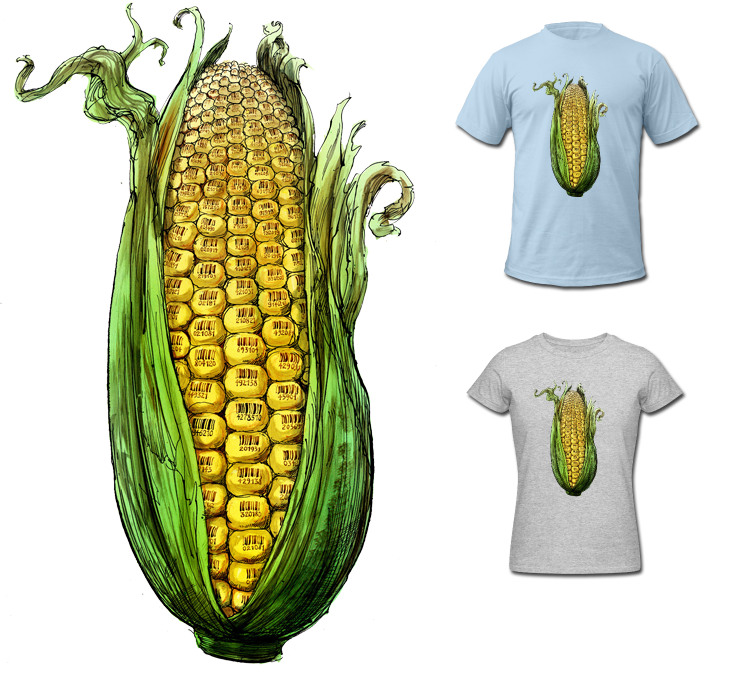 Rainer's piece tells you in an instant what he thinks about GM crops and their dangers. It's classily done, flawlessly executed and perfect for the moving billboard that a good t-shirt can turn you into. You can buy Rainer's design, and more like it from other talented cartoonists at the Cartoon Movement webshop. I'd recommend a look at the site proper for a whole new perspective on politics and world affairs. You know us for our ethical stance and wide range of clothing for all of your promotional needs. But the foundation that Pier32 is built on is one of solid... rock. Gerry, the Voice of Pier32, has strong connections with the music industry, following his days in A&R, and his first company, Headline, specialised in printing for bands, gigs and festivals. That link remains a part of the Pier32 mix today, and we can respond quickly, efficiently and cost-effectively to your requirements. A few examples. We've recently done a print job for tour t-shirts for blues monster George Thorogood, who needed merch in a hurry for the UK leg of his tour. We delivered on time (no mean feat considering the non-existant lead-in time), and on budget. We're also proud to be associated with Alchemea. They are one of the world’s leading international audio schools and specialises in providing high quality sound engineering and music production courses. They focus on high-intensity, hands-on training that gets results. Alchemea are a major player in audio training, and are the place to go if you want to bump your skill set to the next level. From game sound to audio for film to cutting-edge music work, Alchemea have the resources and tutors to help you bring the noises in your head to life. Pier32's big push for the summer is festival based. In conjunction with our partners at Hotbox Events, we're providing all the crew-wear for both Latitude and the Reading and Leeds festival. All the steward tops and hi-vis vests you'll see on site have been provided by Pier32, and they're looking pretty good! 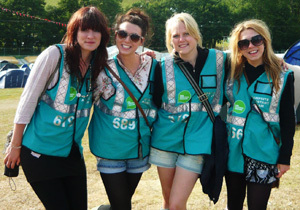 If you're interested in volunteering, there's still time to get your name down for Reading or Leeds. You'll get free access to the festival, food and drink, all-important segregated loos and showers (if you've ever been to a festival, you'll know how important they are!) and, of course, fetching Pier32 crew-wear! So, you can see the broad range of events and organisations that Pier32 can supply to. If you're a band that needs merchandising, a festival that needs crew shirts or hi-vis vests, or a studio or school that needs staff wear, we can quote and supply you quickly and for less than you might think. The contact links are over on the left. Check us out and let Pier32 help you bring the noise. Some heartening news from Bangladesh, after the collapse of the Rana Plaza building in April that killed over a thousand workers. Seventy top European retailers have pledged to open up their buildings to inspectors, and to foot the bill for repairs and reconstruction should they fall below standard, it was confirmed yesterday. As part of the Bangladesh Fire And Safety Agreement, big name brands with a significant presence in the clothing industry there like Primark and Tesco have until July 15th to submit details of their factory suppliers. Then the major work starts. A survey by a Dhaka-based engineering university has found that nine out of 10 Bangladeshi garment plants are risky structures, and many were built without the supervision of qualified engineers. It's estimated that the cost of refitting these structures could be as much as $3billion. Of course, it's not all good news. Gap and Walmart have refused to sign the accord, opting instead for self-regulation. It's heartening to note, though, that fears of this stance torpedoing the agreement seem to have been premature, and the plan includes safeguards and binding two-year commitments to getting the factories up to code. There's still a long way to go, and no-one thinks that the plan is perfect. There's plenty of local complaint that government and factory owners should have been more involved from the start. Nevertheless, it's a major step forward for an industry that's the lifeblood of Bangladesh. It's just a shame that it took one of the biggest industrial accidents ever seen to kick fashion retail into action. How do we move sustainable fashion, not just to the forefront of the conversation, but to the point where sustainability is the norm? There are all sorts of ideas and theories about the best way to shift the agenda forward. One of the most realistic and successful is the Future Threads Project. The brainchild of Paula Ponzer, a writer and thinker on fashion and culture, FTP is aiming high. Rather than targeting suppliers, manufacturers and retailers, it aims to connect and engage people to look at fashion as a whole, and address the values of the industry from the skeleton up. The way I see it is: if you don’t know about sustainability and the problems that exist in the fashion industry; then you don’t know fashion. Harsh, you might think. But the point she's trying to make is important. Half the problem is that people don't know enough about eco-fashion issues, and therefore choose to ignore them. Worse, they view the subject in an entirely negative fashion (scuse the pun) as they are hectored and nagged, and told that disasters like Rana Plaza are their fault for shopping or choosing clothes in the wrong way. FTP is aiming to change that, skewing the conversation into something much more positive, and making sure that the tools are available to find out how to become a more sustainably-aware consumer or producer. It's all to do with social networking. FTP is a collaborative project, bringing together fashion writers, bloggers and industry professionals in an on-going world-wide discussion about how best to bring the conversation about sustainable fashion into the mainstream. By setting up online tools, networking events and meetings, and making it easy to get people together and talking, the end result is much more than the sum of its parts. I ... don’t believe there will be anything called sustainable fashion at that point – what sustainability is, will be common knowledge and that we no longer need to talk about “sustainable fashion.” Anything unsustainable will be looked down on. That's one hell of an end game. I completely get where Paula is coming from. FTP shares a lot of DNA with the Ethical Fashion Forum, enabling interested parties to meet, talk and promote in a welcoming environment. If anything it's more social-media enabled, with heavy presences on Tumblr, Pinterest and Instagram. This is a great way of pushing out the right positive message to a wide pool of potential collaborators or followers. There's more on FTP over at Urban Times, and bo be sure to check out the FTP website. Of course, we at Pier32 are great believers in the power of social networking - have I pointed out the links to our Facebook, Twitter, G+ and Pinterest pages over on the sidebar? Habitat For Humanity are one of our favourite charities, and we regularly supply them with t-shirts. Their simple doctrine, Home=Life, tells you all you need to know about the charity, their aims and goals. They build houses for people who need them the most, in places as far-flung as Argentina and Zambia. But they do sterling work in the UK as well. They are involved in projects in London, Banbury in Oxfordshire and Liverpool that are putting up new builds for, and with the help of the communities at the heart of the initiatives. Better yet, Habitat For Humanity are innovating and exploring new options, including the refurbishment of disused houses and flats, in association with groups like the YMCA and Solace Women's Aid. Using grants, charitable funds and their significant expertise, they're helping to turn abandoned old shells back into viable homes. Habitat For Humanity are also providing valuable training for school and college leavers, allowing them to gather the skills and knowledge they need to get on. The Donaldson Court development in Banbury, that opened last year, provided work and training for 18 youngsters, many of whom went on to jobs that they wouldn't have found otherwise. To find out more about Habitat For Humanity's work in the UK, check out their website. If you're interested in helping out, there are all manner of options open to you, from volunteering to fundraising. For example, The Hope Challenge, that starts this week, is a great way to show support, have some fun and raise some money. Have a look at the Habitat For Humanity Fundraising page and see if you can help build a future for people who need nothing more than a roof over their heads.